Patrick joined Cushman & Wakefield | CRESCO Real Estate in 2006 as Senior Vice President. Pat has been in the real estate industry for thirty (30) years. Pat’s professional services include acquisition and disposition representation, corporate consulting, regional and national account coordination, client representation, site selection, build-to-suit consulting, land sales and investment sales. Pat has successfully worked with several local and corporate clients to handle their real estate needs nationally. Pat has a special focus on representing financial and insurance companies and has completed in excess of 800 assignments in over 30 states to date. Pat’s experience and knowledge has earned him numerous accolades. 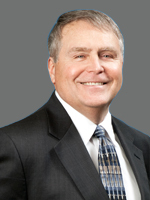 Pat started his commercial real estate career in the late 1980’s with the Ostendorf-Morris Company where he was consistently one of the top office producers. In 1998, Pat was the founding principal for The Staubach Company, Great Lakes Region, where he was a two-time “National Top Achiever,” providing real estate advisory services to office, retail, and industrial tenants. 65-75 ERIEVIEW PLAZA 65-75 Erieview Plz. HUDSON INDUSTRIAL PARK LAND Hudson Industrial Pky.